“The Feds have gone totally off the tracks in their effort to eradicate native wild horses and burros from their rightful range. The subversion of federal law goes unchecked.” ~ R.T.
GRAND JUNCTION — The trap is set. Jim Dollerschell hides up the pink-dirt hill behind the sagebrush and the pinyon pine, not visible from the corral. A trough of fresh water and piles of grass-hay strewn along the ground will lure the wild horses he is capturing into a ring of metal fencing. And when the animals enter the corral, a handful at a time from the canyons and layered bluffs of western Colorado, Dollerschell will hit the button on his remote control. The gate will slam shut. By the end of the roundup this fall at the Little Book Cliffs, the federal Bureau of Land Management hopes to have captured 60 horses from the wild herd of about 190. Dollerschell, rangeland management specialist for the BLM’s Grand Junction field office, will push the horses from the corral to a stock trailer. From there, they will go to a holding pasture in Cañon City, and later, be put up for adoption. The gather is one of 56 roundups planned this year, with a goal of removing 12,061 wild horses and burros from rangeland across the West. That’s about three times as many animals as last year and the year before. In Wyoming last month, the bureau removed hundreds of horses from the Red Desert Complex — often more than 100 per day — by chasing them with a helicopter. Five died or were euthanized after they were injured in the roundup, including a colt with a broken leg and a stallion blinded by another stallion while in a trailer. Two colts were treated for “capture shock,” and one died, according to BLM reports. The federal agency’s efforts to capture wild horses and burros have ramped up this year as the herds have reached the highest levels since the BLM began managing the animals in 1971. Federal regulators also just approved plans, despite public outcry from wild horse advocates, to corral mares in Oregon and remove their ovaries as a means of birth control. There are nearly 82,000 wild horses and burros roaming on public land, plus an additional 47,000 that were already captured and put into holding pens. The available public land can sustain only 26,600 horses and burros, according to the agency’s environmental studies, which is to say the country has 55,000 too many. As the agency’s proposals to curb the population become more aggressive, the decades-long hostility between the federal government and wild horse lovers is escalating. Federal officials say the horses are at risk of starvation and dehydration, that the 26.9 million acres in 10 Western states is not enough to sustain them. Volunteers and BLM staff have trucked in water this summer to prevent horses from dying of dehydration, including in the Sand Wash Basin in Moffat County. When the herds grow too large, public lands are trampled and the forage available for wildlife and livestock is threatened, agency officials said. The federal agency is responsible for managing public land for use by all, including ranchers who buy grazing permits, mostly for cattle and sheep. On some ranges, habitat for greater sage grouse — which are found only in the sagebrush regions on the West — is jeopardized, the BLM said. Mustang advocates, though, say the agency’s numbers are arbitrary. They claim the crisis is one manufactured by the BLM, and that years of mismanagement by the agency have led federal officials to destructive and inhumane tactics. Besides increasing the number of mustang roundups, the BLM plans to remove the ovaries of wild horses in Oregon and study the health and social effects of permanent birth control. Two research partners — first Oregon State University in 2016 and then Colorado State University this summer — pulled out of the controversial project before it was finalized and amid emotional protest. Now the federal agency plans to complete the work without a veterinary school, instead by hiring veterinary surgeons who would remove the ovaries vaginally with a looped metal hook similar to a bicycle chain. A public comment phase ended this month, and the BLM’s field office in Hines, Ore., has announced the research will start in October. Wild horse groups, including the American Wild Horse Campaign, filed legal action last week to stop the agency’s plans. “The fact that the BLM has chosen to move forward with these archaic, dangerous and inhumane procedures demonstrates how far removed the agency is from sound, scientific, evidence-based decision-making,” said Brieanah Schwartz, government relations and policy counsel for the group. Instead of spaying mares, horse advocates want the BLM to increase its use of a birth-control vaccine, called PZP, as well as invest more in researching vaccines that last longer than one year. The Cloud Foundation has asked to manage 150 wild horses on the Stewart Creek range in Wyoming, offering to administer birth control to the mares and record population growth by keeping a photographic record of every horse. In addition to the controversy over spaying wild mares, the federal agency also enraged wild horse groups this summer by changing rules of sale regarding mustangs. Under the old policy, people were limited to buying four mustangs every six months unless an exception was granted by the assistant director of the agency — an effort to prevent sales to buyers who wanted to take the horses for slaughter. Now, under a July rule change, people can buy up to 25 wild horses per sale, as often as they want. Horse advocates accused the BLM of going behind their backs as they were sitting on an advisory board brainstorming solutions to the horses’ swelling population. The policy change means horses are more vulnerable to ending up in slaughterhouses because it makes it more profitable to buy them by the truckload and ship them across the border to Mexico, they said. Few people are “suddenly in the market” for 25 mustangs per day, said Cory Golden, advocacy coordinator for Return to Freedom, a wild horse sanctuary in California. The four-horse limit was put in place in December 2012. Three years later, an investigation from the U.S. Department of the Interior’s Office of Inspector General revealed that 1,800 of the federally protected animals went to slaughter from 2008 to 2012. The horses were sold to a La Jara rancher who later told investigators he brought them close to the Mexican border. He paid the BLM $10 apiece. Despite the change in sale rules, it remains illegal to buy wild horses for the purpose of selling them to a slaughterhouse. The BLM expanded the sale limit to 25 horses to encourage sales to “good homes,” said Jason Lutterman, a BLM public affairs specialist for the Wild Horse and Burro Program, based in Reno. Mustangs up for sale already have been passed over for adoption three times. Without adoption or sale, they remain in the BLM’s holding pastures. Until the early 2000s, the bureau was placing about 8,000 wild horses and burros in private homes every year, enough to keep up with population growth. But a “huge drop-off” in adoptions, coinciding with an economic downturn, meant the captured animals were staying in holding facilities instead of going to homes, Lutterman said. Horse roundups slowed. Adoptions began to pick up in 2015 but have not fully rebounded. This year, the federal agency expects to place only about 4,300 horses and burros, the most since 2007. The cost of the wild horse management program, meanwhile, has swelled to $82 million, making it a target for members of Congress. Nearly 60 percent of the spending — $49 million in 2017 — goes toward keeping horses in holding facilities after they have been removed from the range. Congressman Chris Stewart, a Utah Republican, proposed last year to allow the BLM to euthanize healthy horses it captures. The millions of dollars it is costing the federal government to keep them in pastures could go toward “defense, education, job training or any other worthy cause,” he wrote in an op-ed for The New York Times. Gayle Hunt, founder of the Central Oregon Wild Horse Coalition, said that although the “current administration just really seems to despise every living thing,” previous administrations were not much different in their treatment of wild horses. In the Little Book Cliffs, the grass dried up this summer in the midst of another Colorado drought. The horses, roaming on 36,000 acres etched with deep canyons and steep cliffs, still look healthy, not too skinny. The horses share the rangeland with mountain lions, bears, bobcats and deer. When the bunchgrass and cheatgrass get short, they eat sagebrush and rabbitbrush. There is no sign of them for miles, at times, save for piles of manure on dusty ground. The last roundup in the bluffs outside of Grand Junction was in 2013, and then only 13 horses were removed. Now the herd totals 190, spread across the purple and beige landscape into bands, or families, that typically include one stallion, a few mares and foals. The limit set for Little Book by the BLM is from 90 to 150 horses. The bureau began a fertility control program on the range north of Grand Junction in 2002, injecting mares via dart with a vaccine that causes antibodies to surround eggs, preventing the horses from becoming pregnant for one year. The program reduced the number of new foals each year to between 11 and 26, compared to up to 41 foals in prior years, Dollerschell said. Annual population growth dropped from 20 to 25 percent to 9 to 15 percent. Four mares captured in the latest roundup have been injected with the fertility vaccine and released back to the range. A few days before the start of the September gather, BLM officials and volunteers from a group called Friends of the Mustangs were on the range setting out water and hay. At the start, only a couple of metal panels of fencing guard the food and water, not an entire circle. Horses show up to eat and drink, sometimes within 30 minutes or so of the BLM pickup truck pulling away. Each day, more panels of the corral are added until it’s an enclosure with a gate. That’s when Dollerschell hides in the bushes with his remote control. Within the first 10 days of the gather, which could continue for weeks, Dollerschell had removed 23 horses from the range. The horses are hard to find, especially in the heat of the August sun. But on a recent trip, Peggy Elsmore and Beckie Diehl, volunteers with Friends of the Mustangs, easily spotted two bachelor stallions foraging for grass and shrubs on a distant slopeside. The women quickly determined it was Sparks, a dark bay, and Crescent, a sorrel. The stallions hang together because neither has a herd of mares. The Friends of the Mustangs group, which Dollerschell described as a buffer between the federal agency and critics who don’t spend as much time on the range, has documented every horse at Little Book Cliffs through their markings. Members meet regularly to nominate and vote on the horses’ names. They also work to promote mustang adoptions. IMO this is BLM BS. I do not think there are 82,000 wild horses still free or 47,000 in holding. I think BLM fudges the numbers in order to get more money from Congress. Where is their proof of the numbers ? BLM only estimates . “There is no sign of them for miles, at times, save for piles of manure on dusty ground.” ? And they are over-running the range? Since the BLM doesnt have to follow the law in any shape or form – what will stop them? “The program reduced the number of new foals each year to between 11 and 26, compared to up to 41 foals in prior years, Dollerschell said. Annual population growth dropped from 20 to 25 percent to 9 to 15 percent.” So the PZP did what it was supposed to! There were 41 foals born to this herd – and they are intimating that with all ” the mountain lions, bears, bobcats and deer – there is no mortality? The story being told is that these “poor” horses are unable to live on the very range they have always lived because its arid? Same old same old. How will they justify their budget if the horses are GONE? It’s important to remind every reader and official that ALL areas which legally contain wild horses and burros also include livestock grazing allotments, and that the grazing program annually loses ~ $140 million. It is a massive government entitlement program which benefits only a few thousand permit holders. Especially in times of drought, the logical course is to pull those permits in the fraction of grazing permit areas which also include wild horses and burros. The original law allows permits to be rescinded, revoked, or modified for just this reason, though it is rarely pursued. By sheer numbers livestock dramatically outnumber even the highest estimates of wild horses and burros (most unconfirmable), and during the growing season. Indeed, livestock are placed in areas to eat off the annual vegetation at its peak potential, then moved on. For the BLM to have any credibility wild horses should be released into areas which have had no livestock or horses for decades, and research funded which truly and failrly examines how wild horses interact with their native environment. They evolved here (with the Sage Grouse) and no domestic livestock can make that claim. Craig Downer offers one such proposal for Reserve Design, but the BLM turns a blind eye to any useful research or sustainable strategies, preferring instead the most lethal means imaginable. Thus the relentless pursuit of killing healthy wild animals, and various inhumane methods of tearing out organs to prevent natural selection and reproduction. That they try to pass this off as any ethical or meaningful research is ludicrous. Intentional death and intentional extinction are indefensible “management” strategies at unwilling taxpayer expense. (a)	If necessary to provide habitat for wild horses or burros, to implement herd management actions, or to protect wild horses or burros, to implement herd management actions, or to protect wild horses or burros from disease, harassment or injury, the authorized officer may close appropriate areas of the public lands to grazing use by all or a particular kind of livestock. The only thing BLM has managed with success is the removal of Public from Public Land? The entitlement BLM has needs to end. “They” are getting desperate. They’ve got themselves painted into a corner. Now, more than ever, the TRUTH must be kept in front of the Public and Congress. The Public sent a resounding message saying NO to slaughter, “euthanasia” and sterilization. The Public is fed up with bureaucratic nonsense and corruption. My evolution from Bundy supporter to critic came after much research. That same research also shed a very bright light on the BLM, and only reinforced my initial perception of them as an unchecked out of control agency with far too much power and control of lands in the western United States. n fact, the BLM appears to be little more than hugely successful for-profit business wing of the Department of the Interior, masquerading as a conservation agency. Even worse, they employ nearly 300 armed agents to enforce their receivables and collections. And you thought the Internal Revenue Service was scary. At least we see the IRS coming. Enter the BLM, an agency most Americans know nothing about. So basically, you can thank the BLM for four out of 10 of the balloons floating at your next birthday party. If that isn’t government reaching into your every day life in the sneakiest ways imaginable, I don’t know what is. Let’s think about that for a moment: $5 billion dollars in revenue, nearly half of that from coal, on $1 billion dollars in operating costs. A profit margin that far exceeds those of many of the most successful companies in history. And what about the half that doesn’t go back to the states? Just where is the department and BLM spending that $1.5 billion in net profit? Why is President Obama requesting a $1.1 billion dollar taxpayer funded 2015 appropriation for an agency where revenues are five times operating costs? These are questions every member of Congress should be asking, and to which every American should be demanding answers. 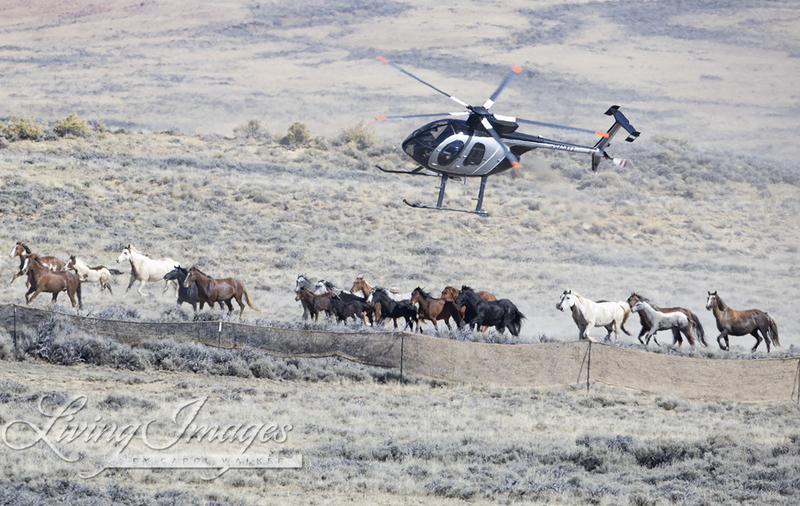 Dave Catoor, the livestock contractor hired by the BLM, has been convicted of Use of Aircraft to Hunt Wild Horses in violation of the title 18, U.S.C. , Section 47, and of Aiding and Abetting in violation of title 18 U.S.C. , Section 2. I was able to get a rare interview with Dave Catoor and virtually everything he told me contradicted what we were [ilming and documenting. Dave went as far to say “if they cannot sell the wild horses in holding facilities, burry ‘em”! This “crises” is self made by BLM! They inflate their horse population numbers. They conduct unnecessary illegal roundups. Barbaric lethal roundups. Just watch the videos. They will make you mad and sad ! They stuff the horses into filthy pens. No cover from the scorching sun. POOR FOOD AND WATER. They separate family units which UPSETS the horses. Foals DIE! The BLM is in the get the horses off the range gang to clear the range for PRIVATIZATION of OUR PUBLIC LANDS!! I do NOT want cattle on MY PUBLIC LANDS just so private ranchers can make more money. NOT ON PUBLIC LANDS! Now they have quietly upped the number of wild horses which can be “adopted” at one time by one person. WINK WINK. They pretend not to know these horses go right to SLAUGHTER !! BLM MUST CHANGE ITS WAY AND BE HONEST AND WORK WITH HORSE ADVOCATES. These wild horses deserve better from humans. BLM: up your game to save lives, not to hurt, harm and slaughter healthy horses. On behalf of Nevada’s Public Land Ranchers, the Nevada Rangeland Resources Commission has approved an aggressive advertising effort scheduled throughout 2017. Nevada ranchers with public land grazing allotments fund the NRRC based on the number of AUM’s they are authorized to graze on their respective allotments. A major portion of the funding will, for the first time, be allocated to a year long, multimedia advertising campaign that that will include the airing of two hour long documentaries, a television advertising campaign and the launch of a social media program. All will be tied to an expanded educational series targeting both our state’s young people and their teachers, according to Rachel Buzzetti, NRRC Commission Secretary. The successful advertising campaign launched in 2016 on Reno TV channels KAME Fox 11 and KRXI My21 will again be aired in 2017 and include 30 second and 15 second commercials under a “Responsible Ranching” theme that will inform viewers of the rancher’s perspective on the wild horse issue, sagegrouse, grazing fees and sustainable grazing. All commercials can be viewed on http://www.nevada rangelands.org by clicking on advertising campaigns. The Stewards educational series originally funded and created in 2013 will be expanded and given new life in an alliance with the Nevada Department of Agriculture’s “Ag in the Classroom” program. It isn’t believable these are the “highest numbers” since in 1971 there was no complete inventory so Congress required one in the WFRHBA. To this day we have no independently verifiable total numbers, but historical documents do mention “millions” and observers claimed wild horses outnumbered the vast herds of Bison pre-settlement. Even if the numbers used are accepted, they are inconsequential compared to domestic livestock grazing on our public lands, and the areas which wild horses and burros can legally exist upon are but a fraction of the overall lands open to grazing. It’s also very clear wildlife populations, especialy big game like Elk and Deer, are typically managed in much higher numbers even in a single state. For one example, Colorado alone is home to around 300,000 elk and over a quarter million Mule Deer, and their habitat is less than half the state. Yet there is no outcry about massive overpopulation for these valued wildlife species. Wild horses are legally wildlife and spread over ten western states even the highest numbers promulgated by the BLM do not represent sufficient scale for the histrionics about overpopulation. This should surprise nobody. The remedy is action from Congress, and Congress is elected by “we, the people.” VOTE THIS NOVEMBER AS IF THEIR LIVES DEPENDED ON IT, BECAUSE THEY DO!